In our world of content, there’s nothing more valuable than collecting the data behind it all. And when it comes to collecting that data, Buzzsumo is an all-in-one package. Competitive analysis, industry research, and even influencer discovery are just a few of the things you can do with the information that Buzzsumo provides. No longer will you need to scour the internet, piecing bits of info together from several different places. No more scraping and ugly datasets. 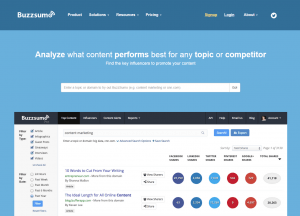 Buzzsumo follows the social web, discovering content and all the information related to it, and presents it to you in an extremely useful interface. Creating your own content in hopes of viral success, backlinks, and promotion can be difficult. Fortunately, many others have done it, and their success is wide out in the open. By selecting Buzzsumo as October’s tool of the month, we’re hoping to shed some light on how you can use it to identify those successes and learn from them. Note: we don’t have any affiliation with Buzzsumo! We just want to make you aware of such an awesome tool! This tool really does have a wide range of capabilities. 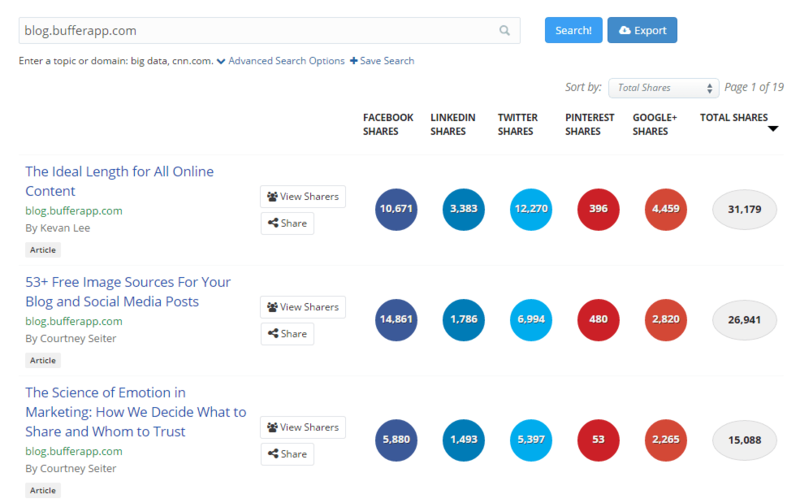 Buzzsumo is constantly collecting social data that reveals a wide range of applications to content marketing. Buzzsumo’s knowledge base holds many tips and use cases. They also maintain a growing list of user-contributed tips. If you get bored with my ideas, you might want to check them out instead! Buzzsumo Pro features are much more accommodating for advanced usage. During their beta, you could access certain things for free, such as exporting searches. This is a huge feature that is sorely missed now that they are out of their beta stage. However, if you feel like the tool can earn you more than $100 a month, you may appreciate the added value you get out of the Pro plan. Needless to say, the tool is still worthy enough to use even with limited free features. In this review, I’ll show uses for both free and pro plans. Don’t worry: I’ll let you know if each item I mention is a paid feature or not! If you ever need some inspiration, you best bet is to look at what your competitors are doing. This tool gives you the capability to not only get a glance into different companies’ content marketing strategies, but to also see what has worked well for them in the past. There are several different pieces of information that you may desire when looking into your competitors. Thankfully Buzzsumo provides multiple avenues of doing so. If you don’t know who your competitors are, try a broad topic or keyword search. The results will be populated with content from your competition. Do any of them stand out? Once you have a competitor’s domain name, start your search all over again. Behold! A wealth of content that has done extremely well within the past year! If you have the Pro plan, go ahead and export that data into a spreadsheet. You can eventually combine several exports of different competitors to see what content has done the best. What do you do with this? Well, you can steal it, but I really hope you don’t. You could also try to remake it, adding your own twists and improvements for your own audience. Or you could simply try to learn why it was so successful and how you could apply their strategies to your own marketing. Here’s a great example that I found when we dug into HubSpot. Their number 2 spot for total shares was a blog post titled “50 Tweetable Twitter Tips You Wish You Knew Years Ago.” It was shared over 9,000 times on Twitter, but had less than 2,000 on all the other social networks. Why? Well, all the post contained was a list of 50 quotes with “click to tweet” links after each one that automatically posted the quote and a link to the full post on Twitter. The post is a total tweet magnet, and it really worked for them! Finding interesting pieces and strategies like this is one goal you might have when using Buzzsumo. Hopefully you can walk away with some interesting content ideas after perusing these results! Not only is it important to see what types of content your competitors are creating and sharing, but it is also important to see exactly how they do it. A quick analysis of Buffer’s blog again reveals that list posts do really well for them. Wednesdays seem to be when their audience is online and sharing the most, with Twitter being their main source of shares. And finally, their content that does the best is more than 3,000 words in length. Analyzing your competition in this way can give you some really juicy pieces of information that may be instantly applicable to your own strategies! Most shared domains – find more competitors! Use this data to find out when and where to post your content, in addition to figuring out what is guaranteed to hit a nerve in the industry you represent! Another helpful area that Buzzsumo accommodates to is the relationship aspect of influencer sharing. Discovering key influencers in your industry allows you to take a look at who they are and what they are sharing. Influencers can be found by topic or by keywords. Try searching an industry keyword and seeing who shows up. These may be people you would want to get in contact with, and build online relationships that any good inbound marketer would enjoy. You might also try and build a list of people to outreach your own content to. This will give you a list of pieces that have been shared by the top ten influencers in the search you previously performed. In one essence, this is what good content is to them and what you might strive to create. If you want to get more specific, try searching with the “shared_all:” operator. This will display links that have been shared by all the users you supply after the search operator. I tried “shared_all:@randfish,@dr_pete” and found some of the most popular articles that Moz has ever put out there! This is very much like Googling your own name, in that anyone that shares the same name with you will appear in the results. However, the results can certainly lead to some interesting finds and strategies. Whenever an informational tool like Buzzsumo comes out, there is often a high demand for automatic reporting. 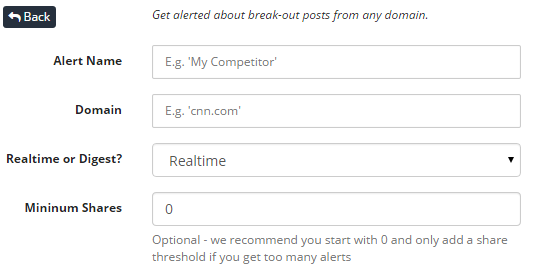 Well, Buzzsumo took that demand and provided an alert functionality that went beyond what anyone expected. Even free users get two alerts! Each alert can be sent straight to your email in real time, as a daily digest, or even set up with RSS feeds for advanced notifications. Simply type in your brand name and be notified when someone writes about it. Some additional settings for this alert allow you to refine your search within the post title and topics, or even the article text. This is great for PR and keeping an eye on your brand… or spying on certain keywords, like your competitor’s brand name or targeted keywords. 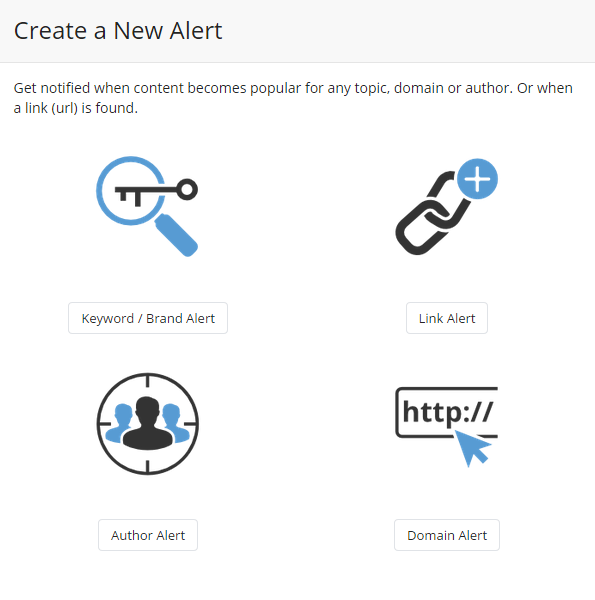 Author alerts is exactly what it sounds like. Get an email update every time a specified author writes an article! Use this to keep tabs on your own name, or perhaps others you are interested in networking with. This is one I am absolutely obsessed with. Here, you can set up an alert that will let you know when someone links to a specific domain, page, or subdomain. You can use this to spy on your competitors and their linking strategies, or just as easily be notified when someone links to you! A domain alert will allow you to spy on other websites and know when they create content. If you only want to be notified when one of your competitors hits a content home run, you can have Buzzsumo let you know once the post reaches a preset number of shares. This way you can always know when your competitors find a new strategy that is a sure success. Okay, stop reading and just try Buzzsumo out already. The features are great, and you’ll find many of uses for this tool. Buzzsumo will only help you improve your marketing strategy by seeing what other things are happening in the online world around you. Let’s face it: the Internet is full of tools that do millions of different things. Some of them are okay. Others are cool, but not very useful. On a rare occasion, tools come around that make you wonder how you ever lived without them. I can honestly say, in such a saturated world, that Buzzsumo will soon be a tool that everyone will use and wish they had years ago. Give it a shot and see what you can find! A New Breed of Free Source Code Editors	Website Content or Design: Which Should Come First?